This is what comes out of my mouth on a daily and hourly basis. I hate that I can't always respond to my children when they want me to. I am desperately asking God to give me wisdom and grace in my time management department. When my children need me to give them my attention I always try to put them first and stop what I am doing; hear them out and then tell them that I need to finish what I am doing before I can play with them or help them in whatever their area of need. It seems that no matter how hard I try to stay on top of things; new things keep piling up... Read more at Arrows and Warriors! Thank you for sharing this at Mama Shares! I connected so much with it. I am so glad. 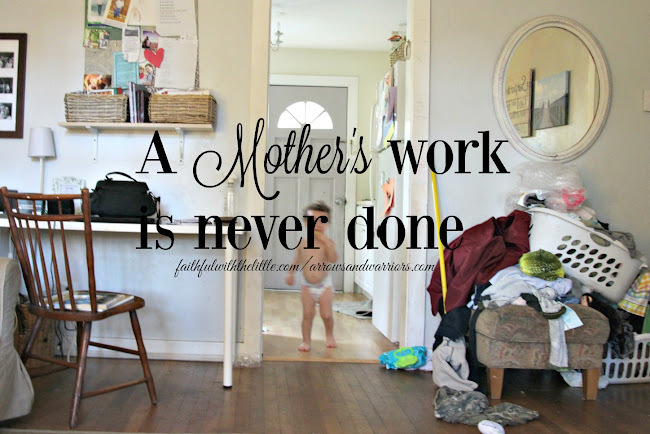 It seems so many of us mamas are juggling housework and caring for our littles. Yes, so very true! Sometimes I just have to stop what I am doing and play/read/listen to my kids--because if I wait until all my work is done, I may never get around to them. It's not always easy but it's so worth it!